Last month we had a stretch of unusually warm weather which accelerated the growth of many flowering tree species. In visiting the Montezuma National Wildlife Refuge over the weekend, it looks like the birds are a little early, too. This is the first time I have photographed Eastern Bluebirds (Sialia sialis) and felt fortunate to find a pair at their nest hole. The male had just pulled his head out of the hole after feeding the little ones. He flew off a few seconds later and the female entered the nest. 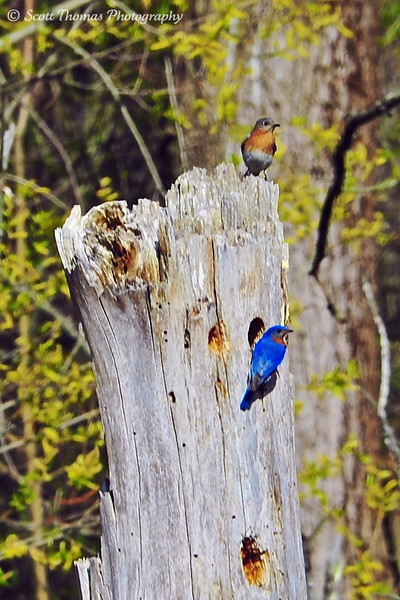 A nesting pair of Eastern Bluebirds (Sialia sialis) at the Montezuma National Wildlife Refuge near Seneca Falls, New York. Nikon D700/80-400VR, 1/250s, f/16, ISO 200, EV 0, 400mm, cropped. Nearby a pair of Mallard ducks (Anas platyrhynchos) were relaxing on the pond the bluebird nest overlooks. 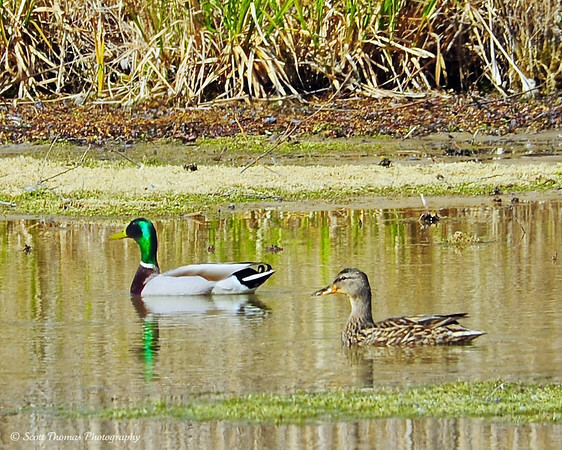 A pair of Mallard ducks (Anas platyrhynchos) at the Montezuma National Wildlife Refuge near Seneca Falls, New York. Nikon D700/80-400VR, 1/250s, f/13, ISO 200, EV 0, 400mm focal length, cropped. 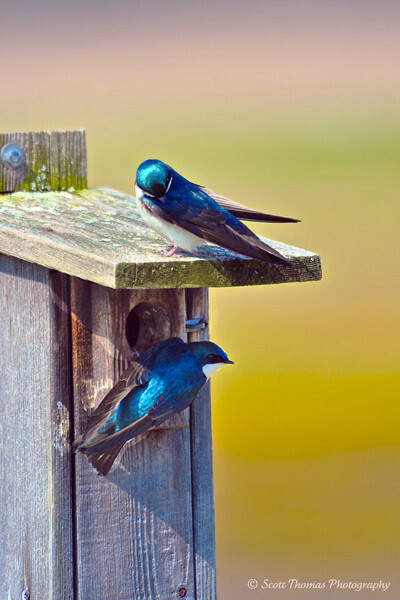 Back at the refuge’s visitor center, the Tree Swallows (Tachycineta bicolor) were busy gathering and feeding their broads at the nesting boxes. A nesting pair of Tree Swallows (Tachycineta bicolor) at the Montezuma National Wildlife Refuge near Seneca Falls, New York. Nikon D700/80-400VR, 1/500s, f/5.6, ISO 200, EV 0, 400mm focal length. The refuge was very quiet and the continued improvements I talked about last year are still being worked on. Those improvements are done by bulldozers, backhoes and dump trucks bringing a lot of intrusions to what is normally a quiet natural area. Once they are completed, I will be looking forward to seeing even more wildlife pairing up. This entry was posted in Animals, Nature, Weekly View and tagged 80-400mm, birds, box, ducks, eastern bluebirds, mallard, montezuma national wildlife refuge, nest, nesting, new york, nikon D700, pond, seneca falls, tree swallows, vr, water, wildlife. Bookmark the permalink. Tree Swallows and Bluebirds are about my favorite birds to photograph. I’ve never seen a pair of Bluebirds at a nest that wasn’t a man made bird house. I have seen many woodpeckers at this pond in the past so there are a lot of natural cavities for bluebirds there. This was the first time I have seen them and I do like that they are in a natural setting. My one wish was I need a longer lens. That photo is highly cropped. Good for the web but not much else. The tree swallows are used to people and I was only about 5 feet away from them. Always busy coming and going. I rarely see them and it was wonderful to catch them here. Scott, is this the bluebird of happiness? It sure looks like it. It is hard to photograph such iridescence. Very shiny in the bright sunlight. These are gorgeous, Scott. I never see bluebirds or tree swallows, so they’re a treat, and I never make good mallard photos, so they’re a treat too. The refuge managers must be doing something right over there. Good for them. Thanks, Gerry! Amazing what a few hundreds miles and a change in latitude will change the kind of wildlife you see. I am reserving my judgement. There was a lot more wildlife around a couple of years ago before they started the project. In the sunlight, the male just popped when he was at the nest hole. I did not even notice the female until I opened up the photos on my computer. Blue birds, I would like to see them in reality. Very nice photos. Come on over and know right where they are. I know…I have only seen them fleetingly myself so this was a real treat.